Life has been full since leaving the leadership of the Minnehaha Church of Christ in 1990. We preached at the McDowell Creek Church of Christ, in the country between Lebanon and Sweet Home, Oregon. The church was not in a community of any kind. No store, no gas station, no school. We drove the two hours from our home in Vancouver for each long weekend. After 18 months, we resigned and encouraged the church to disband and attend one of the several congregations within driving distance. It was our view that the church would not grow, given that everyone drove in from a distance and the church was unable to reach the local community. They continued for another year, then disbanded and sold the building. Several adults were immersed into Christ during our stay there and the church came to terms with an old dispute, meeting with the church from whom they had divided some years before and signing a letter of agreement. For the next 18 months or so, we focused on calling for the Highway 20 Church of Christ in Sweet Home. Attendance was good and parking lot monitors had to be appointed to assist with locating parking places. The long drive each week took its toll on the both of us, but most of the driving became Lois' responsibility. Starting in the mid-90s Lois and I conducted a number of three hour seminars on how to be a grandparent. We built the presentation around a four-part video and incuded our own notes. These were all successful and brought many Christians together to discuss a common interest. Churches that sponsored the Grandparenting Seminars include Scio, Sweet Home, Turner, Englewood and Central Christian in Portland and Wi-ne-ma. About this time, the Englewood Christian Church on the north edge of Portland asked if we could preach and supply part-time leadership. We did this for about nine months (in 1998) until they picked someone permanent for the task. Early in 2002, we spent an additional nine weeks with them as their minister took a leave-of-absence to regain his health. We love their music and their use of the great hymns of the Faith. During the late 1990s and following, we have led history tours to significant sites of the early Churches of Christ. They included stops at the grave of pioneer preacher Thomas C. McBride, McMinnville, site of the first church of Christ at Amity, the site of Bethel College, Monmouth, a tour of the Brunk House and the historic Turner Tabernacle. We have substituted very short video clips for the tour beginning in 2004. The Minnehaha Church asked us to work in a limited capacity so we focused on Missions and Seniors for the congregation. Late in 2001 we were asked to take charge of the physical property as well. During 2002 and into 2003, the building has been upgraded with carpeting and hardware. 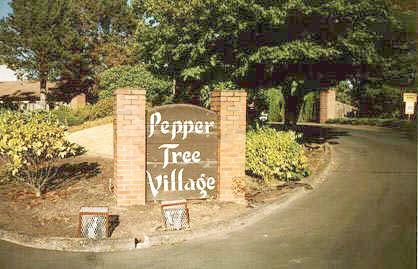 We have enjoyed living at Pepper Tree Village since the last few days of 1979. During the 1980s, I served as the president of the condominium association board. For the past several years, I have been been elected and reelected as the treasurer of the Association. The board contracts out the day-to-day financial matters and my role is to recommend policy on finances. Our association has become financially sound recently as compared with the early 1990s. The board works together very well and has created a safe environment that has allowed many residents to live here securely up into their 90s. The grounds are kept attractive and there is no crime. Life has slowed some in 2004 - 2005 because of prostate cancer. We elected to have radiated seed implants to put an end to the problem. We are satisfied with the outcome.